It has been a crazy week around here. Winter has officially arrived in all its glory. 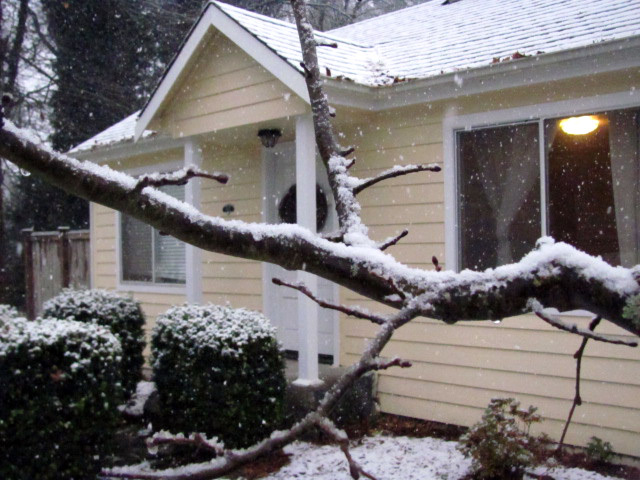 The week started with a surprisingly large windstorm that blew through Monday night. Then I was jolted awake Tuesday morning by a 4.2 earthquake, which isn’t actually a weather pattern but it still added to the strangeness this week. Another storm came through Wednesday and through the night complete with hail and a lighting show at around midnight which I just happened to be awake to see. We ended the week with an early cold snap that is bringing snow on Sunday and into Monday. We’re keeping our fingers crossed for a snow day tomorrow! So, needless to say, this week seemed like a good time to hunker down and work on my ever-growing craft pile. I finished the curtains in the living room that I started a couple of weeks ago along with the accent pillow covers I’ve been meaning to make since we moved in. Then I went on to experiment with some Christmas presents. Finally, in a truly creative daze I made a really cool fabric headband that I’m kind of in love with. I am eager to make more and, of course, share the pattern with you! While Alaina and I are hunkered down tonight waiting for the school delays and closures to roll in we’re sipping a super chocolatey hot cocoa dotted with mini-marshmallows. 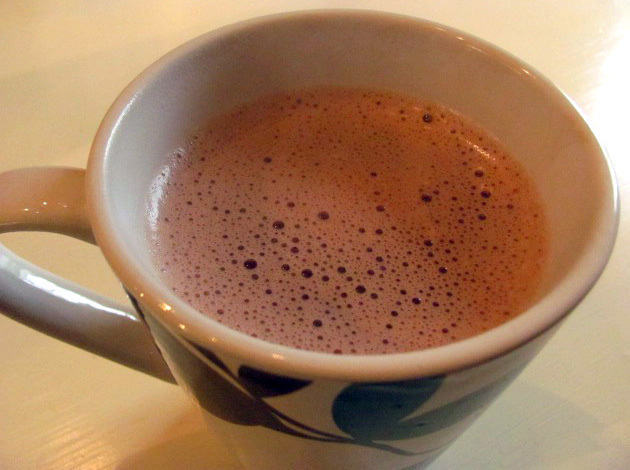 I have a love affair of sorts with hot chocolate; for the longest time my favorite was Swiss Miss but once I read the ingredient list it kind of make my stomach curdle. So, I am on the hunt for a perfect homemade mix, but in the meantime this stove top version with cocoa powder and milk is pretty amazing. Hope those of you in the pacific northwest are staying warm tonight! In a medium-sized saucepan, whisk the cocoa powder and sugar together. Mix in the water and bring to a gentle boil over medium heat, stirring frequently. Add the milk and whisk to mix, gently warm over medium heat, careful not to let it boil over and burn. Once the cocoa is heated through, remove from heat and add vanilla. Pour into mugs and garnish with mini-marshmallows, a candy cane, or a little Irish Cream! This entry was posted in Beverage, Winter and tagged Beverage, Chocolate, Winter. Bookmark the permalink. mmmmm, so much better than Swiss Miss! If ever you want an elegant grown-up treat, steep a tablespoon of lavender buds (home grown, Sequim grown or even from Whidbey or San Juan Island) in the warm milk for 5 to 10 minutes. Just be sure to add the milk to the chocolate through a tea strainer. The flavor is amazing, but finding buds in your coco is just weird. Debs…. another field (ok, I’m in the city, Square-foot gardens) to table Washington native. Oh that sounds lovely! I will have to give it a try, thanks for the suggestion!